I am currently creating a collection that brings to light the remarkable relationships in prairie and alpine ecosystems of the West. Bison, wolf, prairie dog, nuthatch, salamander, and sage grouse are the subjects of completed images to-date, with a rare butterfly and an endangered trout soon to come! 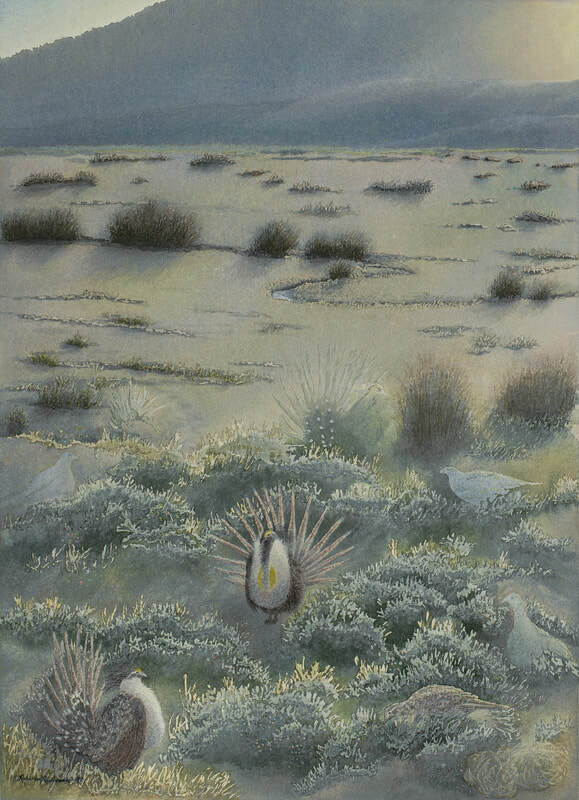 Home for Sage Grouse ~ Watercolor & Pastel ~ 14 x 10"
It was still pitch black outside and I was doing my best to stay warm. The sun finally began to peek over the ridge. The light created sparkles of color on the dew-covered sage. Off in the distance, I thought I heard the mating call, and then I was able to see them through the scope! So exciting! I signed up for a field trip with Sisk-a-dee, an organization focused on protecting the endangered Gunnison sage grouse and its habitat. “Sisk-a-dee” is a Shoshone word for the bird which is a Native American symbol for “the rhythm of life”. Today, most sage grouse populations are in decline due to many factors, including loss of habitat and invasive species introduction. As you view this painting, see the two males in their elaborate courtship dance to win over the beautiful hen nearby. See five more grouse who are one with the sagebrush forest. Let’s preserve this special habitat and keep huge swaths of wild places…wild; in balance and harmony, and in tune with the rhythm of life. 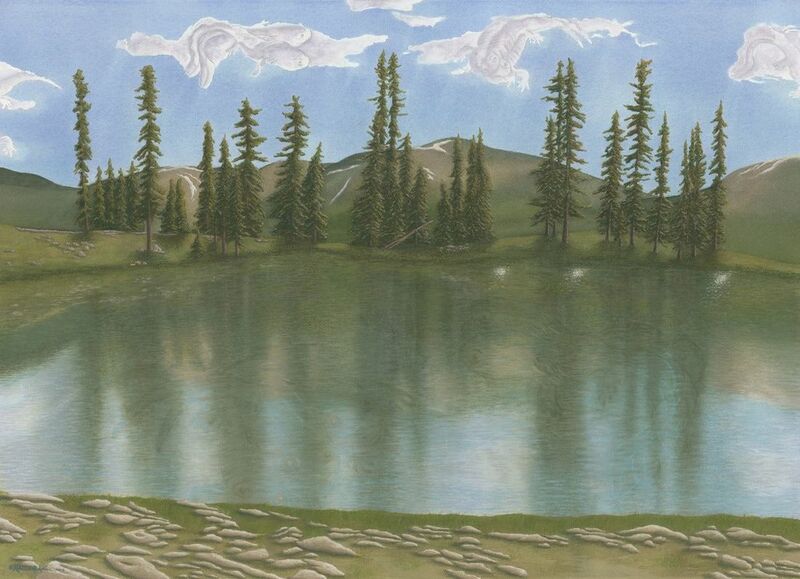 Home for Tiger Salamander ~ Watercolor & Pastel ~ 21 x 29"
This painting shows one of the high alpine ponds at Mexican Cut, a Nature Conservancy preserve near Crested Butte, Colorado. Scientists are studying the effects of climate change and acid rain on the composition of these glacial pools and wetlands. Tiger salamanders are part of this important work because many individuals in this location don't fully develop and remain partly in their aquatic form with two front legs and a tail, never leaving the water. As you look closely, see the clouds in the shape of salamanders. See their reflections in this quiet pool. As high alpine ponds become more pristine as a result of less pollution, the populations of our beloved tiger salamanders will become more viable. ​Pygmy nuthatches are tiny, communal songbirds that flit from branch to branch with boundless happy energy. I've enjoyed hours watching them and listening to their cute “rubber-ducky” calls. Pygmies breed in large extended-family groups and need mature pine forests to successfully nest. During cold winters here in the West, these little birds even roost together to stay warm. In this painting, I highlight the connection of mature forests to healthy populations of songbirds. Pygmies, once common, face challenges today in places like Colorado where I live because of heavy land use alteration and forest clearing. Let's keep our mature pine forests flourishing to ensure that these adorable songbirds have a bright, beautiful future! Home for Wolf ~ Watercolor & Pastel ~ 20.5 x 28.5"
This image brings attention to the ever important predator/prey relationships in nature. Every species is connected to the whole. 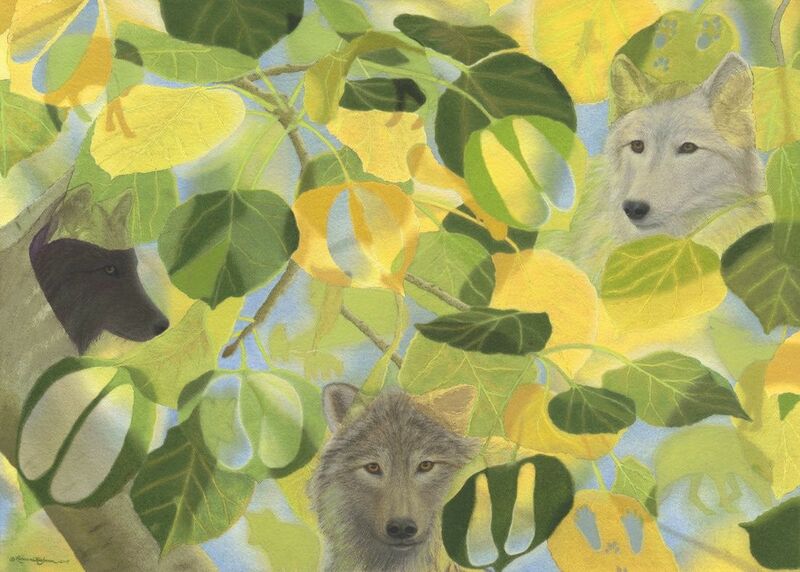 As you look closely, within the aspen leaves, you’ll recognize footprints of animals critical to the survival of wolves, such as moose, bison, deer, elk, snowshoe hare, jack rabbit and bighorn sheep — all herbivores woven perfectly into the tapestry of life; as is the wolf, a predator who keeps prey populations healthy. Within the leaves throughout the painting, I’ve placed shadows and images of wolves to highlight the important social hierarchy of the pack. Imagine the preservation of the Great Plains, a place where bison herds can once again roam free. A place where the ferruginous hawk flies peacefully overhead. Imagine the rare white buffalo, a sign of new beginnings according to some native American Indian tribes. If you look closely, you can see the white buffalo as one with the wind swept prairie grasses (bottom left corner). Imagine people and wild creatures living in harmony and balance. Imagine bison as one with the prairie. 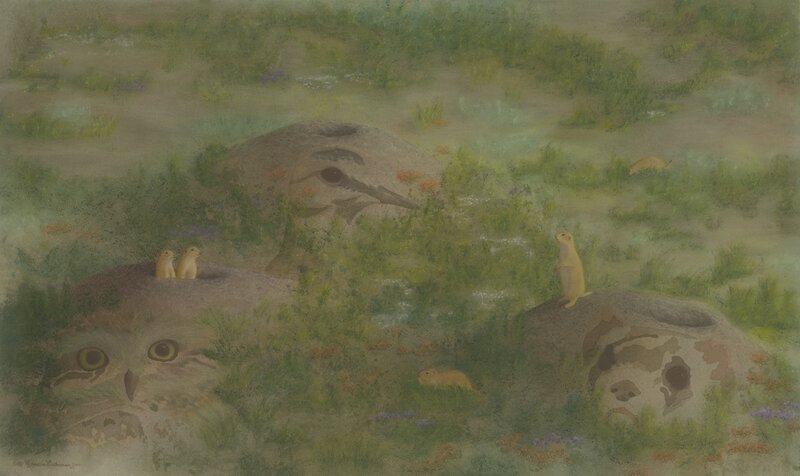 Home for Prairie Dog ~ Watercolor & Pastel ~ 17.5 x 29"
The black-tailed prairie dog, a hallmark of the American West, is a keystone species that many plants and animals depend on. We grow fond of these darling creatures as we watch them scamper here and there along trails and roadways in our nation’s grasslands. We need prairie dogs. They increase vegetation health by regularly cropping grasses and herbs. Short plants provide a better source of protein to the grazers that feed on them, such as bison, antelope, deer and elk. Prairie dog burrows provide shelter to mountain plovers, burrowing owls and black-footed ferrets; species listed as threatened or endangered. 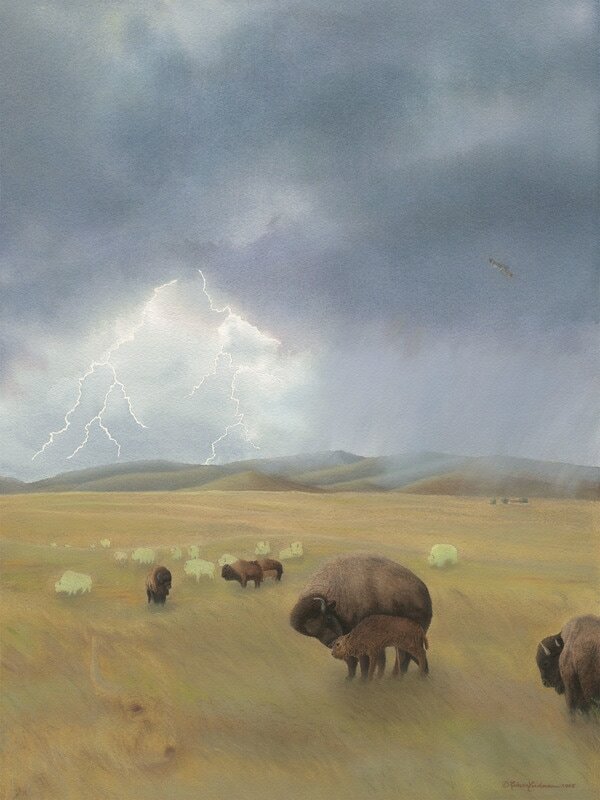 In this painting, I focus on these rare species and prairie dogs to illustrate that every life form is connected, a universal theme throughout my work.